Ghost... what do you think about that word?? something bad?? something that sometimes following you?? They can see us, but we can't see them... Now, what happened if we try to make or find or something else to the unseeing creature?? Ghost Lab is a weekly American paranormal documentary television series that premiered on October 6, 2009 on the Discovery Channel. Produced by Paper Route Productions and Go Go Luckey Entertainment, the program is narrated by Mike Rowe. 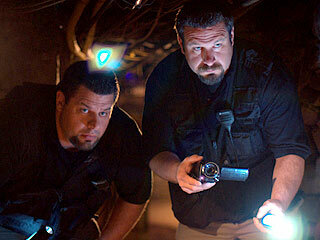 It follows ghost-hunting brothers Brad and Barry Klinge, who founded Everyday Paranormal (EP) in October 2007. During investigations, the team used various investigation equipment, including thermographic cameras, infrared cameras, digital audio recorders, data loggers, EMF meters, laser thermometers, motion detectors, and EVP recorders, as well as a mobile command center called the Ghost Lab, which featured interactive computer monitors, noise filtering audio programs, and various high tech gear. The team also used a variety of paranormal theories to test out some of their techniques during an investigation.